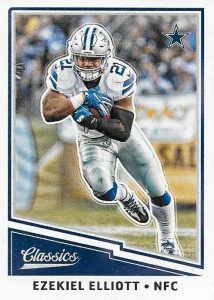 2017 Panini Classics Football again applies the allure of the Donruss brand to the past and present stars of the NFL. Hobby boxes average one autograph and one relic. 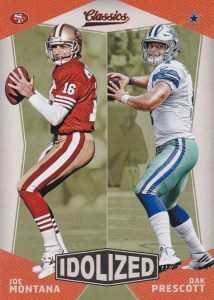 Working with a fairly simple design, the 300-card base set is evenly split between veterans, legends and rookies. 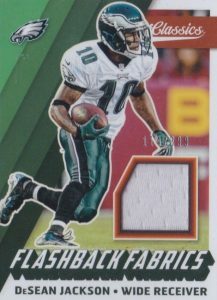 Every pack yields a base rookie card and there are also Blank Back, No Name and Full Name parallels, numbered to 50 copies or less. Sepia short prints for the top veterans fall at a rate of one per box. 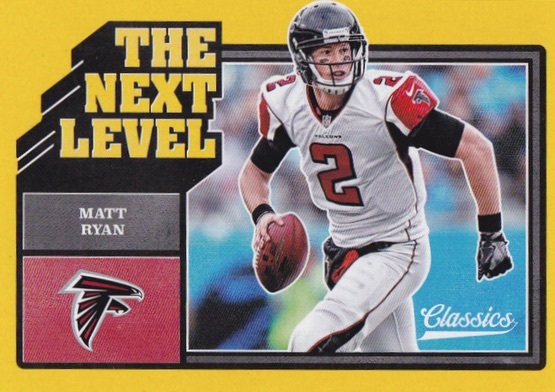 Dropping one per 2017 Panini Classics Football hobby box, on average, autographs include Rookies Significant Signatures and Stadium Stars Signatures. Multi-player autograph editions like the Classic Combos Signatures insert pairs two players with a shared connection. Averaging two per case are the hard-signed Buyback autographs that come from the original Donruss lineup. 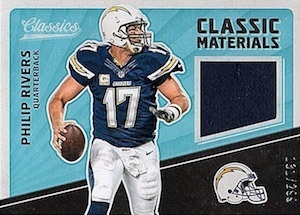 Moving to the relics, a new box hit in 2017 Panini Classics Football, choices include Canton Collection Swatches for Hall of Fame members. 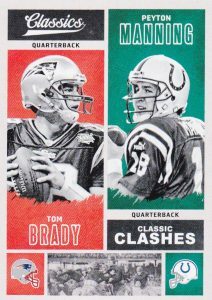 Just like the signed version, Classic Combos Memorabilia honors two players, this time with relic pieces. 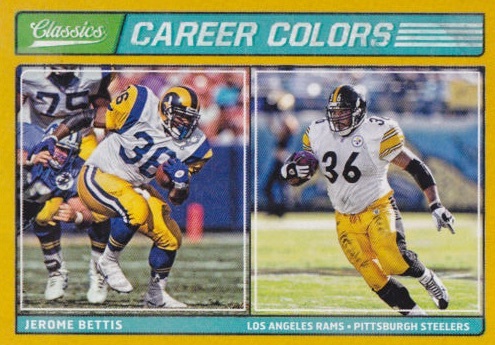 The Prime parallels up the quality of the swatch and drop the print run to 50 copies or less. 300 cards. Shop complete sets on eBay. PARALLEL CARDS: Glossy, Red Back #/299, Blue Back #/175, Blank Back #/50, No Name #/10, Full Name #/5. 63 cards. Shop autographs on eBay. 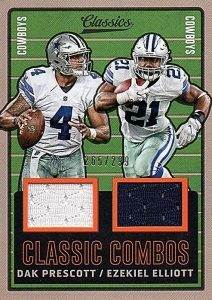 PARALLEL CARDS: Orange #/10 (Robinson, Gore, Matthews - #/5), Blue #/5, Black 1/1. All subjects not included in Orange/Blue parallels. View specific options with the full spreadsheet. PARALLEL CARDS: Orange #/10 (Manley - #/25), Blue #/5 (Manley - #/10), Black 1/1. *Portis, Gannon found only in parallels; Randle found only in Black parallel. 90 cards. Shop autographs on eBay. 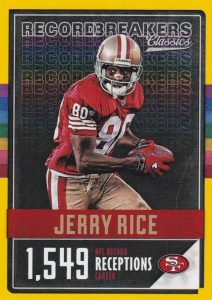 PARALLEL CARDS: Gold #/49 or less, Orange #/25 or less, Blue #/10 or less, Black 1/1. 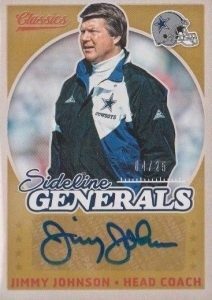 PARALLEL CARDS: Prime #/50 or less. *Howie Long not found in Prime. View specific parallel numbering with the full spreadsheet. *Manning not found in Prime. View specific parallel numbering with the full spreadsheet. 346 cards. Shop on eBay. I’m seeing that there is a master case with 2 inners. Safe to say 1 buyback auto per inner case? That appears to be the case but it is not expressly stated. Trying to decide between Classics and Score for set building with my son. It’s interesting that they use Jim Brown on the promotional artwork, but there’s no Jim Brown card in the set? 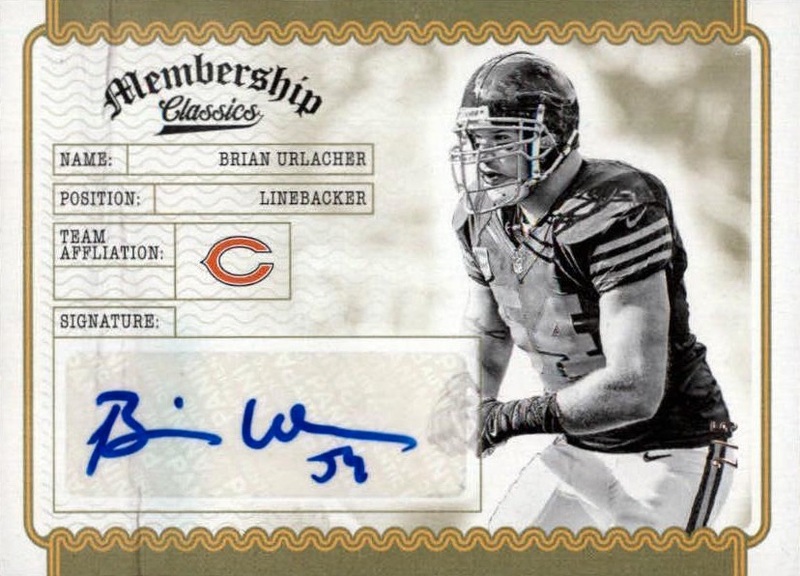 Still, some nice-looking cards/autos/variations. Wish they would add more varied old-timers next year. Lots of HOFers have yet to appear in this set. Very poor bang for the buck if reselling. Too many /299 parallels and bogus glossy cards. Panini did well on this one. Just opened 2 hobby boxes and have just about the entire base set. Also loaded with cool inserts, no names, full names etc from veterans. A great balance between HOF, Legends, and Rookies and most of all it is cheap. Pulled Jerome Bettis Significant Signatures 1 of 1, Antonio Brown Classic Materials (Game Used), Paul Hornung Canton Classics Prime 2 color patch, and a /25 orange Travis Rudolph. I am a Steelers fan, so this was about as good as it could get for me. All bias aside, really good bang for your buck on this product. last years product is now over 66% off at blowout. Love these cards! How can you tell which ones are glossy? They all look glossy to me. I absolutley love this stuff its right at that price point where it doesnt really sting the wallet too hard. Pulled the terry bradshaw buyback redemption and a marvin jones relic but what i love is that the stuff is now numbered. 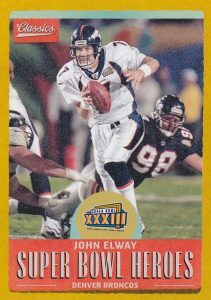 I also pulled a kiser rookie #’d to 99 so that was the icing on the cake. For everyone complaining about a checklist get over yourselfs. These guys gather the information for free. Like the product although had a weird situation to write about. 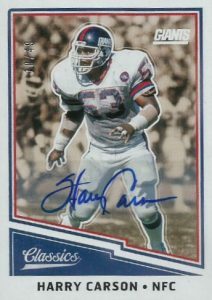 Received the Steve Grogan Black 1 of 1 signature and upon further analysis, realized that there is apparently an uncorrected error on the card. Noticed this on another #’d /10 auto of his but wanted to see if there was any additional information on it. If you look at the Completions and Attempts, the number were swapped so the Comp. % is listed as 191.2% Was this error ever corrected? I bought 2 boxes with 8 packs and 8 cards in each. So that comes out to 128 cards. I did not get 1 single special card or anything to brag about. Just normal crappy rookie cards and some older players except this is produced in 2017 so worth nothing. Really disappointed as I have bought single packs of other brands and other box sets and have obtained a plethora of great cards. What a waste of 40 bucks. 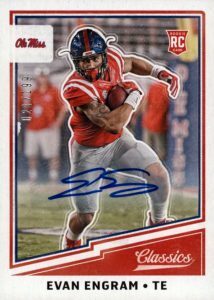 2017 PANINI CLASSICS FOOTBALL HOBBY BOX - 1 AUTO & 1 MEM! 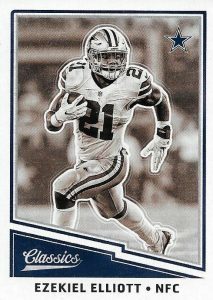 2017 Panini Classics Football Hobby Box - Factory Sealed!